It was the day before Labor Day 1957 and the countdown had begun for the end of summer and the new school term. From Long Island to Little Rock, crisp black and white marbled composition notebooks were hastily purchased, and last-minute yellow Dixon number 2 lead pencils skillfully sharpened. I need shoes, she needs shoes all children need shoes. To prepare for the big school launch, a visit to the shoe store was in order, as summers canvas Keds, were sorrowfully replaced with sturdy, sensible school shoes. Getting my brother Andy to trade in his shoe of champions for a pair of Kindergarten approved Oxfords was no easy feat. I too would trade in my knitted booties for my very first shoes. Getting that extra care to start tots toddling was oh-so-important. It was none too soon for my feet to start getting the protection they would need. 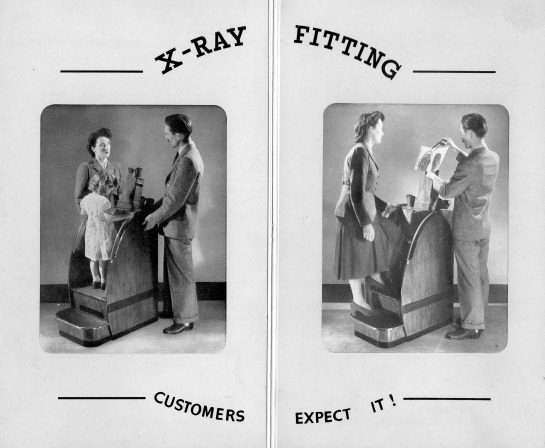 And lucky for me our local shoe store no longer had to rely on the old-fashioned 6 point fitting plan, but could take advantage of the miracle of the x-ray fluoroscope. 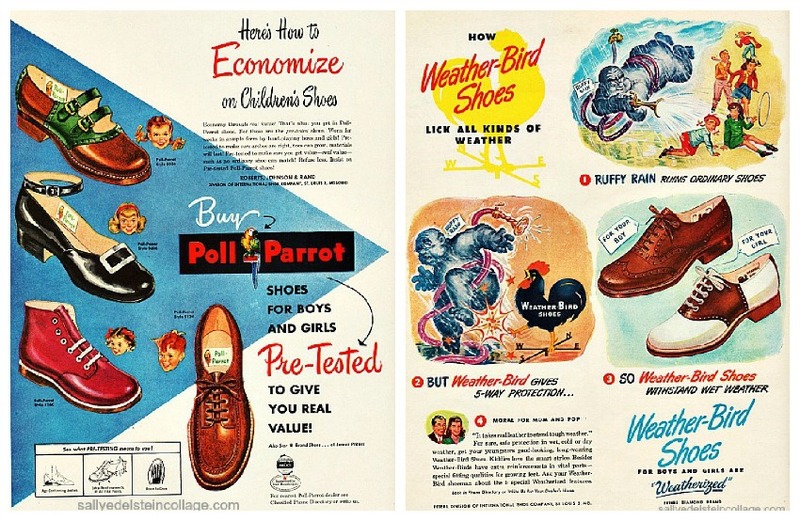 All week-long radio commercials were competing for attention on the airwaves as all the shoe stores were offering pre Labor Day sales and new school term incentives. Because the number of US small fry kept rocketing upward at a phenomenal clip it was a business bonanza with shoe dealers competing for the right to dress your youngsters feet. 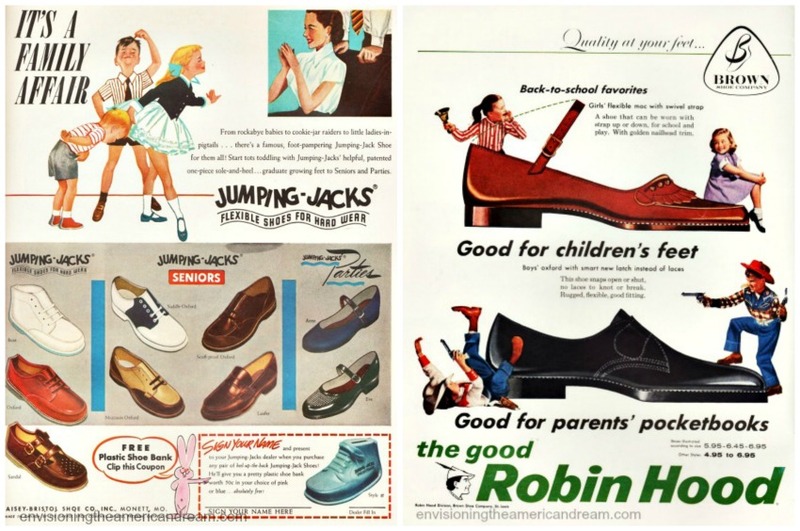 From rockabye babies to cookie jar raiders to little ladies in pig tails, each company promised form-pampering shoes for your child that would outperform any other. But only Buster Brown at Henleys Shoe Store could boast of that futuristic apparatus -the fluoroscope, to x-ray your feet. “Every parent will want to hear this important news! 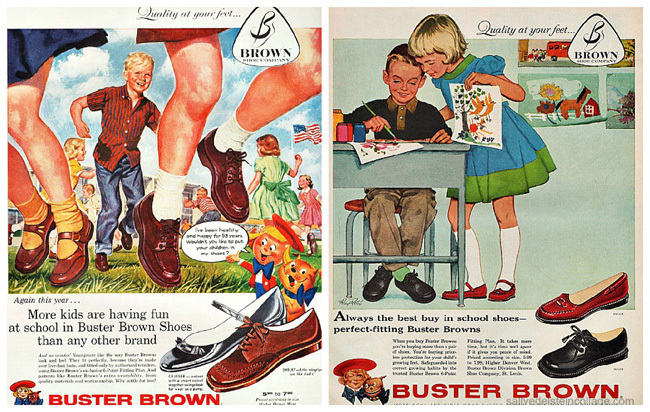 Staring at the big plastic Buster Brown lighted dealers sign we stepped in to the crowded, stuffy store. 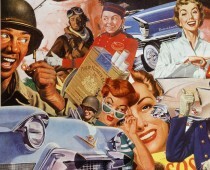 Once in the store, crowds oohed and ahhed as children of all ages toddled and walked down the blue carpeted runway with its picture of a winking Buster Brown and Tige, in new sporty saddles, hard-working Oxfords and the hands down beauty-shiny mary janes. While the shoe salesman measured my feet, my trigger-happy, have-gun-will -travel brother Andy was off shooting down a rogue pair of Oxfords with his cosmic atomic ray gun. The plastic gun shot powerful electronic colors beams on the tall wall of floor to ceiling shoe boxes. I jiggled up and down on Moms lap and curled my toes when the shoe salesman measured my feet. His pudgy fingers with thickened yellow nails had nicotine stains between the first and second fingers of his left hand, as he placed my foot in the classic Braverman metal shoe measuring device. Even this once scientific breakthrough 25 years earlier was now old-fashioned. The salesman looked and sounded remarkably like Andy Devine, the gentle giant, a rotund, high-pitched gravelly voice host, who coincidently hosted a show sponsored by who else…. Buster Brown. Gently, he placed my foot in the fluoroscope- x-ray machine, a big box that looked like an old radio floor model. My tootsies were ready to have their picture taken. His well-practiced “Here’s looking at you kid” guaranteed to elicit a giggle from Mom. With the seriousness of a doctor and the expertise of a scientist his foot side manner created just the right blend of scientific know how and showmanship. Naturally my brother Andy was fascinated by the fluoroscope- it was not unlike something that Captain Video that technological genius had invented like the Opticon Scillometer a long-range x-ray machine to see through walls. Placing my foot inside the box I could see all the bones of my foot glowing white in a hazy green foot. My future in footwear captured forever. I remember this almost exact experience – except I was the oldest kid by a LONG shot, like 8 years older than the next sibling, 9 from the one after and almost 11 from the baby. 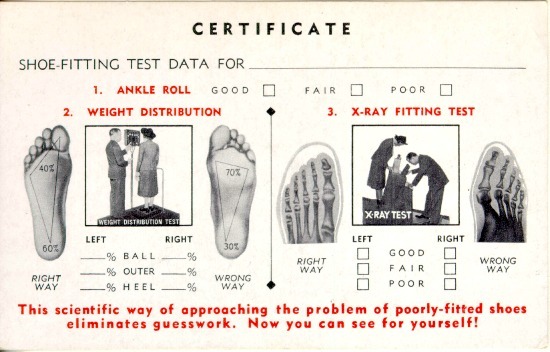 I remember getting my feet measured in the xray box, and looking at the picture it produced of my foot inside a pair of shoes I did not want to wear, and didn’t have much say about. I was always longing for the pretty shoes that the other girls in school got to wear (and more than one pair to choose from I noticed) but the stretched family budget would not tolerate so many shoe purchases. I ended up usually with one pair of shoes that were very neutral in color and appearance (just plain ugly to me) usually some kind of plain, sturdy brown Hush Puppies oxfords that would go with almost anything in my limited wardrobe. Besides, my feet grew pretty quickly over the years, and it wasn’t too unusual for me to have to get another pair before school was out because I outgrew the ones I started with. One year, it was 3 pairs. Didn’t mean I got any further in the style category – just a bigger pair of the same most of the time. 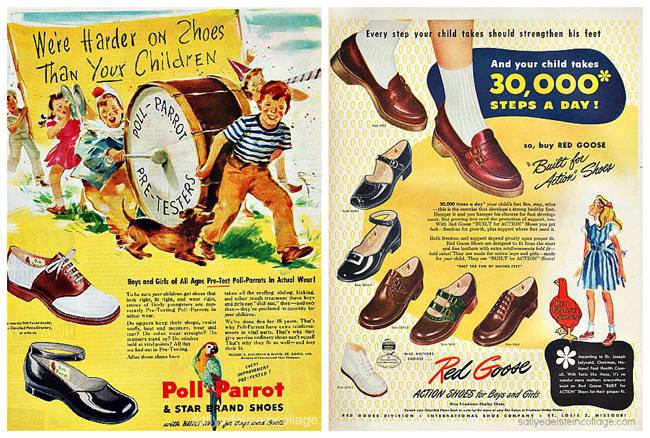 Only once could I convince anybody that I really wanted a pair of saddle oxfords, in blue and cream. I thought they were beautiful, and I got one pair once. Of course you couldn’t convince my Depression-raised WWII vet stepfather that having more than one pair of shoes at a time would make them last longer, because you didn’t have to wear the same pair every single day – it was one pair of shoes. Period. But, I digress. The xray device was really the only reason I wanted to go to the shoe store to begin with. I was fascinated with it, and already had an abiding interest in the medical profession, which this thing reminded me of. It’s probably no surprise to anyone to learn that I became a shoe “horse” after I got married at 19 and had money of my own to spend on any pair of shoes (or beautiful winter coat – same story, different garment) that I wanted! No xray box anymore, but I didn’t care – it was the shoes I was after! Thanks for sharing your experience. Due to the wide spread popularity of these x ray machines, is it any wonder that baby boomers have an inordinate amount of orthopedic problems? Having spent 6 of over 15 years working as a Surgical Technologist (“scrub nurse”) for a 12 member group of DPMs at their private group surgery center, I saw more than anyone’s normal share of Baby Boomers’ damaged feet from poor choices in footwear. Oddly enough, all of them had much more to do with women’s bad choices in adult footwear than the relatively short period of time they spent wearing shoes fitted with the help of those unshielded xray devices as children. High heels that push the foot forward into the toe of the shoe, and narrow toes that squeeze the normal structure of the forefoot into abnormal configuration were/are much more responsible for bunions (which can’t be “shrunk” with any pads, tapes or chemical concoctions since it’s an actual joint deformity), hammer toes (likewise), heel ‘bumps’ and so on are all found in cultures that demand style over fit and function. Grandma’s bunions and other foot deformities came from shoes that delivered only style in her youth and working years on her feet, and she had few options later on besides those lovely Orthopedic oxfords with extra-wide toe boxes, shorter blockier heels, stronger arch supports, and other fit adjustments that would have served every woman better had they been included in the style and fit of shoes worn over the earlier years of foot abuse. Women were actually getting the right idea in the days of the “Power Suit” and the blouse with the fluffy bow tied pertly at the neckline in the 80’s when they started wearing their jogging/running shoes to and from work everyday, and carrying their less forgiving and less supportive dress shoes in a bag. As a working mom during the 80’s when I had those “pink collar” jobs, I insisted my dress shoes be comfortable first, and fashionable second. Yes, I took some abuse from the more stylish members of my crowd, but I have not a single bunion, hammertoe, ingrown toenail or other self-inflicted foot deformity, which is much more than many of them can now. When I began work on my feet 8-10 hours a day (or more) in thr OR’s, I spent good money on good shoes, professionally fitted, and replaced them as often as necessary, usually every 6 months or so. Never worn outside of work, primarily for reasons of hygiene and cleanliness, they were also a tax writeoff as professional uniform expense!